Catherine Simmonds Asialink Theatre Residency, 2011-2012. Gillian Howell's Asialink community music residency, 2010-2011. Arts and Disability Project, Baucau district 2010-2011. Exhibition: Children's Artwork from Afalyca Community Centre, Baucau. This research sought to map intangible cultural heritage practices associated with rock art sites in Suku Tutuala, Lautem, Timor-Leste. The project supports the Secretariat of State for Tourism, Art and Culture, Government of Timor-Leste, in their ongoing investigation, safeguarding and promotion of the rock art heritage in the Lautem Administrative Post. The Tutuala region in far eastern Timor-Leste is one of the richest regions of rock art in island South East Asia. More than 30 sites of rock art on cave walls include hundreds of painted images, estimated to be at least 2000-3000 years old. Traditional life is strong in this isolated region of the small island nation of Timor-Leste. Villagers enjoy cultural practices that have spanned generations, connecting the Fataluku people to their ancestors and stories of creation. Findings of this small research project indicate that cultural elements reflecting motifs of the rock art are still in regular use. 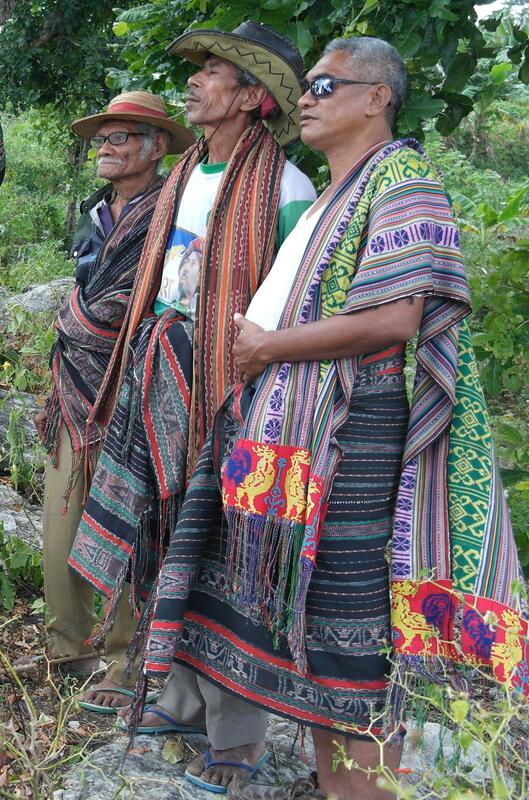 Tais, traditional weavings used for ceremonial and practical functions, include the largest number of motifs. Images of the cloud, eagle mouth, horse, three boats and poria leaves regularly appear in tais woven in the area. Stories shared by elders connect the rock art with the images in the tais, as well as sacred objects and items not able to be depicted. A song in the vaihoho style, of unaccompanied call and response, is still sung about the rock art, although this is sacred (lulik) and is unable to be documented for public information. Villagers also know a voton, an ancient singing prayer, in which sailors call for safe passage. While they report that this song does not relate directly to the rock art, its themes connect contemporary villagers with ancestors who came from over the sea and depicted their journeys in drawings in the caves. 1. Safeguarding the Intangible Cultural Heritage in the Nino Konis Santana National Park; Fó Salvaguarda ba Patrimóniu Kulturál Imateriál iha Parke Nasionál Nino Konis Santana; Kultura I hupa-hupatat Parke Nasional Nino Konis Santana mucunet afakam uhulen tana naum apale. 4. Voton- singing prayer for sailors; Voton -ema ró nia kanta harohan; Voton enia Timor ifai-fainu ratan cal pal naen nau ane. 6. Koinepepe- dance for collecting sea worms; Koinenepe – dansa ba foti meci; Koinenepe- Meci i fa’i-fa’inim me mesene. Image: Photo: Vaihoho singers from Tutuala. Photographer: Ildefonso da Silva.